The refreshed 2010 Porsche 911 GT3 RS got caught with its pants completely down and we've got the photos to prove it. Having recently revealed an updated 2009 Porsche 911 Carrera, Cabriolet and 2009 Porsche 911 Targa 46, Porsche has laid the framework for the model we're really interested in, the GT3 RS. 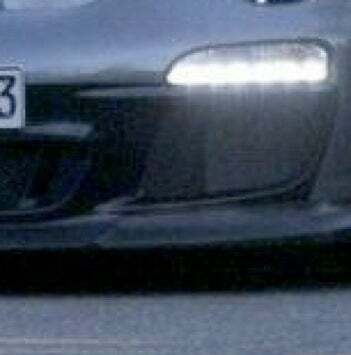 In these recently taken photos of the new Porsche 911 GT3 RS, you can see that it receives a mildly revised front fascia with larger side intakes and the blinker/LED DLOs from the new Carrera model. It also appears that the lower lip spoiler has been re-sculpted to allow for better airflow around the front end. The rear of the car carries on with the same spoiler as the previous version and the taillights are the same LED units as the rest of the revised 911 line-up. The big change to the rear is an all-new rear fascia with a single large vent on each corner as opposed to the dual split vent setup on the previous model. The lower trailing edge of each vent sweeps towards the center, up and over the exhaust. Expect the RS to carry on with its unique theme of decorative stripes; exterior colors; contrasting painted mirrors, wheels, rear spoiler endplates and rollcage. Moving on to the wheels, if you look closely, you'll see the coolest change that Porsche has made to the new model. The new GT3 RS will, as standard, feature Porsche's center-lock hub that was debuted a few months ago as an option on the 911 Turbo model. PCH, Cheap Turbo Porsche Edition: Mystery Turbo-ized &apos;77 911 or Gutted &apos;78 930? The powertrain will come from the current cars 3.6-liter flat six but will most likely gain direct fuel injection or a tweaked version of the new 3.8-liter flat-six from the revised Carrera – which could produce around 440bhp, allowing it to best the current cars 0-60 time of close to 4 seconds and 193mph top speed. Either engine will likely be offered with Porsche's new DSG-style PDK transmission. You'll be able to taste the rainbow next year when the revised 911 GT3 RS reaches dealers in all your favorite skittles colors.